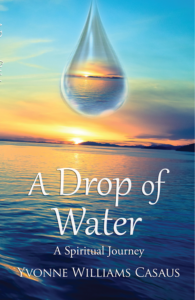 Today we are pleased to feature A Drop of Water, written by Yvonne Williams Casaus. Ms. Casaus is currently on a virtual book tour hosted by iRead Book Tours. Check out her full schedule below or on her iRead Book Tours Page. We hope you will stop by other sites for interviews, reviews and articles. You will find it a thoughtful book will inspire and refresh–one you won’t want to miss. The author has kindly written an article to share with us here at Jaquo Lifestyle Magazine. We would love to hear your comments to share. We must all learn how to embrace the adventure of life. There are days I have no energy, when I wish I could curl up in bed. Then there are days I feel vibrant and ready to take on the world. It is part of the road, part of the journey. If we do not enjoy the journey, how can we enjoy the destination? Instead of thinking, I will be happy when…..(insert blank).. Happy when I get there, when I get thin, when I get this job, when I have this amount of money, etc, etc,. Embrace this very moment. This second, right now, this is part of the adventure. The only way I have found to embrace this adventure of life is to surrender to it. To trust it will work out as it needs to. It is so hard to trust. To trust the process, trust the journey; trust your higher power, to trust God. Trust can be pretty scary especially if we do not know how to trust ourselves. Sometimes trust can feel naïve. How do we accept the unknown? In every adventure there are twists and turns. Yet when they happen, I too get scared to death. I want to control the outcome. In order to truly trust I have to have faith. I have to surrender to the fact that there will be scary times ahead. I have to believe that things will work out how they need to. That even the hard times are part of the quest of life. Adventures come with fun, with excitement, with hardships. How can life not be an adventure? I looked up the definition of adventure; an exciting experience, usually involving danger and unknown risks. Ha! If that doesn’t define life, I don’t know what does. It describes my life anyway. If I had understood how to think of life as an adventure when I was young, I think how differently I would have lived. To trust that life is guaranteed to come with unknown risks, yet can be exciting and fun. It is the infinity symbol, with continuous ups and downs. Imagine embracing change rather than fearing it. So, just for today, embrace it. Trust it. Be the picture in the magazine. I see the image of a beautiful, smiling, happy woman hiking the desert. Her hair is transforming into beautiful butterflies. She is enjoying the blue sky and vibrant hummingbirds nearby. The clouds are shaped like hot air balloons. So even if you are in the desert, make the most of it. Breathe in the invigorating air, feel the breeze against your skin, smell the flowers, enjoy the view. Embrace the adventure. It becomes a beautiful poetic journey as she discovers her love of water as part of what led her towards her spiritual path. Through her writing she expresses how she found her way through several tremendous losses, including the loss of her husband. In her ability to endure, she found a strength she never knew she had.This book is for anyone that has ever struggled with depression, grief, or loss of any kind. It is for anyone interested in personal growth and healing. By sharing her personal story she is able to remind us that we are never truly alone. Water connects us all. Yvonne Williams Casaus is a Mom, Wife, Author, Counselor, and Play Therapist. 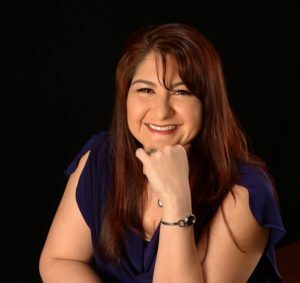 She is an independently licensed Clinical Mental Health Counselor (LPCC), a Registered Play Therapist (RPT), and is certified in Eye Movement Desensitization and Reprocessing (EMDR) therapy. She specializes in Depression, Trauma and Posttraumatic Stress Disorder (PTSD). She has a private practice in New Mexico and has been helping adults, children, adolescents, and families for over eleven years. This is very inspiring. Makes me want to travel and embrace any adventure. Thank you so much for featuring my book. I appreciate the feedback. Today is International Day of Peace so I wish you a wonderful and peaceful day.